The 2019 season will see the opening of three Minor League ballparks -- in Fayetteville, North Carolina; Las Vegas, Nevada; and Amarillo, Texas. These facilities will host the Woodpeckers, Aviators and Sod Poodles, respectively. If all goes according to plan, 2020 will be an even bigger year for new ballparks. 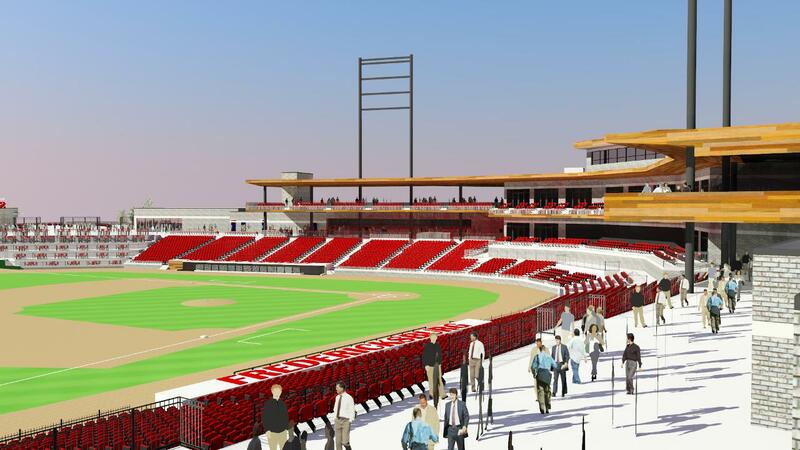 Four Minor League stadiums are slated to join the landscape in 2020, which would be the most openings in a single season since six facilities debuted in 2009. 2020's imminent quartet? Madison, Alabama; Wichita, Kansas; Fredericksburg, Virginia; and Kannapolis, North Carolina. What follows is a brief overview. • Madison, located in the Greater Huntsville area, will host the relocating Mobile Bay Bears. The team, which has already announced its name as the Rocket City Trash Pandas, will play in the Southern League as the Double-A affiliate of the Los Angeles Angels. A groundbreaking ceremony took place in June; construction is currently on schedule for the $46 million, 7,000-capacity ballpark. • It's been a long road, full of fits and starts, but the Potomac Nationals are finally on the cusp of moving out of Pfitzner Stadium and into a new ballpark. The ballpark in question will be in Fredericksburg, Virginia, approximately 30 miles south of the Carolina League club's current Woodbridge location. The deal between the city of Fredericksburg and P-Nats ownership (led by Art Silber) was announced in November, a "shared use" agreement for a $35 million multi-purpose stadium. Per Fredericksburg.com, the agreement calls for the Silber family to "finance, build and maintain the 5,000-seat stadium. Fredericksburg will be considered an 'anchor tenant' in exchange for an annual payment to the club of $1.05 million for 30 years." Construction in Fredericksburg has yet to begin. • Wichita, Kansas, last hosted a team in the form of the Texas League's Wranglers, who played at recently demolished Lawrence-Dumont Stadium. The city's new ballpark will exist in the same location and become home of the relocating New Orleans Baby Cakes (Triple-A affiliate of the Miami Marlins). Funding for the stadium was approved in November; the following month the city picked five companies to design and build it. Construction should begin next month. Lou Schwechheimer, majority owner of the Baby Cakes, told the Wichita Eagle that a "Name the Team" contest for the incoming Wichita franchise will soon commence. Once a name has been picked, graphic designer Todd Radom will create the logo. • Whereas the above three facilities are slated to house relocating teams, the new ballpark in Kannapolis, North Carolina, will host the South Atlantic League team that already plays in the city: the Intimidators. The Kannapolis city council unanimously approved the $52 million project on Sept. 24, and a groundbreaking ceremony was held the following month. The ballpark is part of a 150-acre rehabilitation of Kannapolis' downtown. "To have that blank canvas to rebuild an entire downtown around a community vision, where everything fits together because it's all part of a master plan, that just doesn't happen anywhere," said Intimidators owner Andy Sandler, speaking to wsoctv.com. The Intimidators currently play at aptly named Intimidators Stadium, which opened in 1995. Last August, the International League's Pawtucket Red Sox announced their intent to relocate to Worcester, Massachusetts, to play in an "innovative downtown ballpark ... that would be scheduled to open in 2021." In the four months since this announcement, significant progress has been made. On Sept. 25, per the Worcester Telegram, the Worcester city council "approved a loan authorization of up to $100.8 million for the construction of a 10,000-seat ballpark." The following month, the city council approved a financing plan, green-lighting "the first in a series of bond sales" that will fund the project." The approval of the loan authorization paved the way for the Worcester Redevelopment Authority to select a project manager and architect for the city-owned ballpark. Skanska USA was chosen in the former category, D'Agostino Izzo Quirk Architects in the latter. The Pawtucket Red Sox, Boston's Triple-A affiliate, are owned by a group headed by former Boston Red Sox president Larry Lucchino. Lucchino and other team officials have been spending ample time in and around the central Massachusetts city, working toward creating a facility that, Lucchino told media, will "look and feel and taste and smell" like Worcester. The Pawtucket Red Sox, meanwhile, have two seasons remaining at their longtime home of McCoy Stadium. It remains an open question what will become of the facility after the team departs for Worcester.